The ugli fruit (Citrus tangelo or Citrus reticulata × Citrus paradisi) is a cross between a tangerine, a sort of mandarin orange, and a grapefruit, sometimes a pomelo. Citrus fruit in general are known to hybridize easily and the ugli is no more than the the result of a natural cross between the above mentioned citrus species. The first such fruits were discovered in Jamaica where they continue to grow and be grown up to this day. As suggested by its name, the ugli fruit does not have a very appealing appearance, yet is quite popular due to its refreshing, sweet and tangy taste as well as several other felicitous traits passed down from its more distinct citrus relatives. The ugli is considered to be a type of tangelo, a hybrid between pomelos or grapefruits and tangerines. Both the juicy, citrusy flesh and the pith hold a good nutritional value and boast antioxidant, anti-inflammatory and anticancer properties. What does the ugli fruit look like? The ugli is a somewhat round citrus fruit about the size of a grapefruit. It has a particularly thick, green-yellow, bumpy, leathery rind with orange smudges that indicate ripeness. Ugli fruit have an inconsistent, dull color which, paired with their visibly thick, bumpy rind, gives them a rugged appearance. The advantage, however, is that the rind is quite loose and thus easier to peel than that of most other citrus fruit. Ugli fruit tend to have fewer seeds than other species of citrus fruits such as grapefruits, oranges, pomelos or tangerines (a type of mandarin) or none at all, as well as a thicker, fibrous pith or albedo (white, spongy part in between the rind and the flesh). The flesh is light-yellow, sometimes yellow-green and is divided into sections just like an ordinary orange. What does ugli fruit taste like? While the rind-flesh ratio is not ideal, ugli fruit are quite juicy and boast a pleasant sweet, citrusy fragrance. As for taste, the fruit is significantly less bitter than a grapefruit and boasts a slightly tangy flavor and a mild sweet taste reminiscent of oranges. As is the case with all citrus fruit, the rind too can be used to flavor various baked goods or even dishes to which it imparts a fresh, sweet, orange-like fragrance. The fruit generally ripens from December to January in Jamaica, but it can be found in stores up until April. 1) Generous source of vitamin C. It is estimated that 100 g of ugli fruit may contain up to 70% of the RDA of vitamin C. Vitamin C supports the production of collagen in the body, a process which helps maintain healthy and elastic skin, among others. A generous daily intake not only supports immunity and cleanses the body of toxins, but also exerts a strong antioxidant and anti-inflammatory action with potential anticancer effects. Moreover, vitamin C promotes gum health and helps keep blood vessels clean and healthy, contributing to cardiovascular health. Eating citrus fruit such as ugli fruit or oranges, kiwifruit, strawberries or even bell peppers on a regular basis provides the body with generous amounts of the vitamin and contributes to better health. The more sour fruits are, the higher their vitamin C content is. 2) Low in calories. 100 g of ugli fruit contains about 45 kcal, a good energy value for anyone looking to stay fit and maintain a healthy, steady weight. While it can be consumed as it is, ugli fruit can be added to morning cereals, fruit salads or even enjoyed as a side dish for a more pleasant culinary experience. You can peel it, then separate the individual sections with your hand or remove the peel and cut the fruit to your liking. 3) Good source of dietary fiber. According to Nutrition Data, one serving of ugli fruit (122 g) contains 2 g of dietary fiber. Dietary fiber binds to fats at the level of the digestive tract and prevents the intestines from absorbing part of them. This indirectly contributes to lowering LDL (bad) cholesterol and triglyceride (a type of blood fat) levels and helps maintain a steady weight and a slim figure by making us feel full faster and not overeat. 4) Lowers high blood pressure. In ugli fruit as well as in oranges, pomelo or lemons, the albedo or pith (the white, spongy part in between the rind and the flesh segments) is a great source of important health-boosting compounds, notably dietary fiber and antioxidants such as the flavanone hesperidin. According to research, hesperidin can help reduce high blood pressure and cholesterol levels and exerts a strong anti-inflammatory and antioxidant effect. Preliminary studies suggest it may possess chemopreventive effects as well. You can read more about the benefits of your favorite citrus fruits in fruits foods map here. 5) Rich in antioxidants. The juicy flesh, fibrous pith and thick rind all contain strong antioxidants such as vitamin C, hesperidin and countless flavonoid compounds with a beneficial action on our health. Antioxidants scavenge harmful free radical molecules and prevent them from altering normal cell activity, a mechanism believed to prevent cells from becoming cancerous. Moreover, antioxidants exert anti-inflammatory properties and further contribute to protecting against chronic disease. 6) Improves digestion. Unless you suffer from gastritis, acid reflux or any other digestive problem having to do with your stomach producing too much acid, ugli fruit and citrus fruit in general may prove great for you because of their generous dietary fiber content. Dietary fiber improves the digestion process itself by feeding the good bacteria in our gut, regulates intestinal transit time and relieves constipation. While the fruit itself contains decent amounts of dietary fiber, the pith is an excellent source of it. 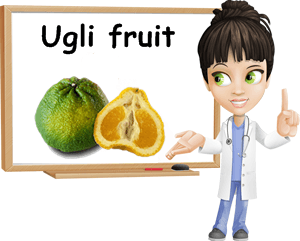 Eating ugli fruit comes with no unpleasant side effects. Though it is a hybrid of grapefruit, it does not contain furanocoumarins like it. Furanocoumarins are compounds in grapefruit that inhibit an enzyme which reduces the amount of medicines that enter our bloodstream. In other words, eating grapefruit may actually increase the amounts of certain medication in our bloodstream and make its effect stronger. Depending on the medicines you are being prescribed, this may be either a good or a bad thing. For this reason, it is best to talk to your doctor about anything you are eating while under certain medication.